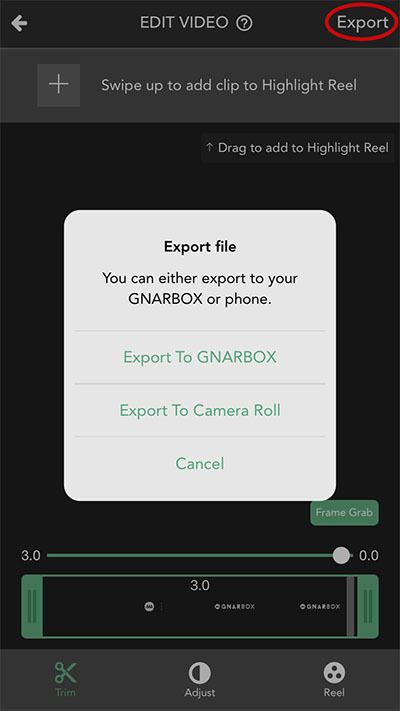 Exporting and sharing your edited photos or Highlight Reel with GNARBOX is quick and easy! Click the Export icon and select the resolution you'd like to export your Highlight Reel at. Choose to export your Highlight Reel to your phone's Camera Roll. You can view its progress in the Task Manager. Once the video finishes processing, you will get a notification that GNARBOX is downloading the video to your phone. Make sure you do not leave the app while this is happening! Once your video has finished downloading to your Camera Roll, you'll be able to view it immediately. Click the Export icon and select what resolution you'd like to export your Highlight Reel at. Choose to export your Highlight Reel to GNARBOX. You can track its progress in the Task Manager. Once your video finishes processing, you'll be able to view it immediately on your GNARBOX. If you have a single clip and want to export it to your Camera Roll, doing so is simple! Preview the file you wish to export. You can do this with a file that is currently on your GNARBOX or with a file that is on a memory card. Click the Share icon in the lower-left corner. A message will pop up indicating the locations you're able to save your file to. To save to your mobile device choose "Save to Camera Roll". Make sure you do not leave the app while the transfer is taking place! When the transfer has completed, the app will notify you. From the "Edit" screen, tap Export in the upper-right corner. If you choose to save to the GNARBOX, you can track its progress in the Task Manager. If you choose to save to your Camera Roll, make sure you do not leave the app while the transfer is taking place! When the transfer has completed, the app will notify you. To control the amount of compression in your video export, you can easily change your video bitrate on the Settings page. For a full tutorial on configuring your bitrate, check out our Bitrate Configuration Settings article. Once you've finished editing your photo, tap the Export button in the upper-right corner. You will be prompted with the option to save to your GNARBOX or Camera Roll. Choose your desired destination. If you have a single photo you want to export to your Camera Roll, doing so is simple! If you are saving a JPG image, your file will begin to transfer. If you are saving a RAW file, you will be prompted with the option to save either a RAW or JPG file. Tap the option you wish to proceed with. 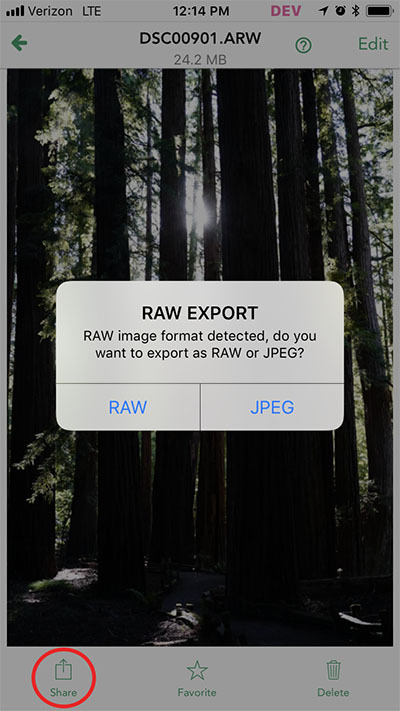 Note: in order to export a RAW file, your photo must be a RAW image. Batch export is a useful tool for saving multiple files to your device's camera roll. This allows you to edit multiple clips or photos and then save them to your device all at once, saving you time and effort. It also allows you to batch export RAW image files for easy editing in a 3rd party editing app! For a full tutorial on exporting multiple files, check out our Batch Export article.